arius currently leads Human Safety Innovation Capabilities Department and Environmental Safety and Sustainability Department at Procter & Gamble, USA. He is responsible for research and development functions in creating human and environmental toxicity assessment methods based on the latest science achievements (e.g. toxicogenomics and other gene expression analysis, bioinformatics, cell cultures, biodegradation of chemicals, bioaccumulation studies, product Life cycle analysis and more). Darius manages the work of 50 employees in research laboratories in Cincinnati, Brussels, Frankfurt and Singapore. 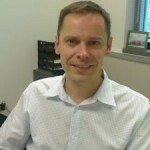 Darius has more than 15 years of experience in Procter & Gamble in the areas of governmental and professional cooperation, environmental studies, technology assessments in Vilnius, Warsaw, Brussels, London and currently in Cincinnati. Darius holds a Bachelor degree in Biology studies in Vilnius University, a Master degree in Environmental Studies in Cambridge University and PhD in Chemical Ecology and Ecotoxicology, Lund University, Sweden.